Inbound marketing is a digital marketing approach focused on attracting a targeted audience, based on their specific needs and interests. The focus is on earning the attention of a targeted audience through content and interactions that are relevant and helpful - not interruptive. Inbound marketing strategies consists of using your website, blogs, search engines, and social media to get found by your potential customers. By creating content designed to address the problems and needs of your ideal customers, you attract qualified prospects to your website, while building trust and credibility for your business. Traditional outbound marketing tactics have historically been based on getting your message in front of as large of an audience as possible, hoping that a few of those people will find your message of interest, compelling them to reach out to your sales team for more information. Most often these traditional marketing messages are delivered in a way that interrupts people and it tries to steal their attention. Many of the advancements in technology today are designed to block these outbound marketing tactics. People are so fed up with them that it has created entirely new industries. Not only is there constant development of new technologies to block these messages, but they also require a large upfront investment and are extremely difficult, if not impossible to measure. The major problem with these outbound marketing approaches; they become less-and-less effective by the day. Which means, the traditional outbound marketing playbook is broken. Instead, Inbound focuses on attracting customers through relevant and helpful content by adding value at every stage in your customer’s buying journey. The best part is… it’s based on a proven scientific method, not guesswork. This will provide your business with a steady stream of new leads and customers. And it doesn’t stop there, the inbound methodology continues to help businesses adapt to fast-changing needs – not just with marketing, but with the entire customer experience. With the inbound methodology, you have an unfair advantage for growing your business and getting customers who buy more, stay with you longer, refer their friends, and tell the world they love you. You don’t want just anyone coming to your site. You want people who are most likely to become leads, and ultimately; happy customers. How do you get them? You attract more of the right customers with relevant content at the right time – when they’re looking for it. Once you’ve attracted website visitors, the next step is to convert those visitors into leads. You do this by opening up a conversation that works best for them. Once you’re in touch, you answer questions and provide relevant content that is interesting and valuable to each of your personas – and continues the conversation. You’ve attracted the right visitors and converted the right leads, but now you need to transform those leads into customers. How can you most effectively do this? The sales tools available at this stage make sure you’re closing the right leads at the right time, faster and easier. Provide a remarkable experience for your customers. They have high expectations of your business so it’s even more important to engage with, delight, and make your customers successful. We work with a limited number of companies per industry. 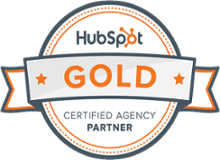 We're a HubSpot Gold Partner and Inbound Marketing Agency based in Cleveland, OH.